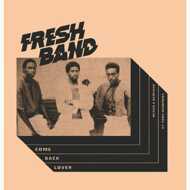 Official remastered reissue from the original tapes of The Fresh Band's highly sought-after 1984 classic 'Come Back Lover'. Produced by The Strikers' Darryl Gibbs and mixed to maximum effect by the one and only Tony Humphries, this super cool disco boogie floor-burner made it big in the Underground dance clubs of Chicago & New York, receiving heavy rotation from legendary DJs like Mancuso, Larry Levan and Ron Hardy. This special re-release from Best Italy contains for the first time all the four versions mixed by the legendary Tony Humphries : including the astounding Tony Humphries Vocal, Dub, Remix and the rarest Dub Remix which moves towards a deeper, headier groove, with atmospheric echoing vocals and mind-blowing piano breaks.